Though most popular during February and surrounding Valentine’s Day, jewelry with a heart theme is a year-round bestseller in the Szul online jewelry store. The heart is one of the most enduring symbols in jewelry design, symbolic not only of romantic love but also of platonic affection. A heart pendant makes a fantastic “just because” gift, the ideal reminder of a treasured personal connection. Heart pendants and other heart-themed jewelry also make excellent presents for special occasions such as birthdays and anniversaries. The heart pendants available from Szul feature many innovations, with a rewarding diversity of styles and variations from which customers can choose. 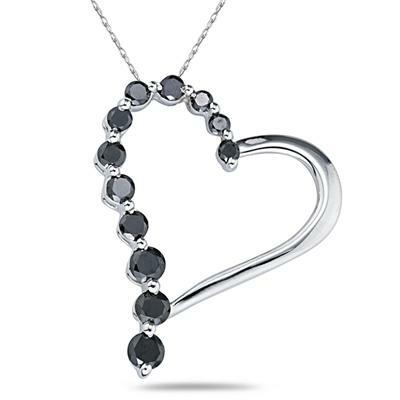 On display above is an eye-catching 1.00 Carat Black Diamond Journey Heart Pendant in White Gold. This pendant combines the familiar heart aesthetic with the meaningful journey pendant design, with multiple stones in a line representing a relationship’s growth and progress. The black diamonds used in this design have a sophisticated mystique, adding a sense of stark contrast to the classic heart visual. Szul’s bestselling heart jewelry shares this common theme of innovation on the timeless heart image, allowing every visitor to find a personal twist on the beloved symbol. With multiple customer incentives in place, visiting our online jewelry store is just like shopping at your favorite local boutique. Get started at http://www.szul.com/diamond-heart-pendants. This entry was posted in Beautiful, Diamond, Diamonds, Gorgeous, Jewelry, Love, Pretty and tagged diamond jewelry, Heart jewelry, Necklaces, Pendants, szul. Bookmark the permalink.